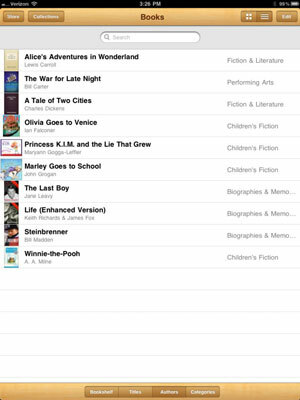 To start reading electronic books (e-books, or iBooks) on your iPad, you have to fetch the iBooks app in the App Store. As you might imagine, the app is free, and it comes with access to Apple’s iBookstore. For now, just know that iBookstore is an inviting place to browse and shop for books 24 hours a day. Change the view: If you prefer to view a list of your books rather than use this Bookshelf view, tap the button toward the upper-right corner of the screen (labeled in the figure). In this view, you can sort the list by title, author, or category, or you can rearrange where books appear on the bookshelf. Rearrange books in Bookshelf view: Hold your finger on the book you want to move. Wait a second or two and it will increase in size slightly to let you know it’s now moveable. Without lifting your finger, drag the book to its new location and then release. Rearrange books in List view: Tap Edit (in the upper-right corner) and then press on the three horizontal lines to the right of the book you want to move. Now drag the book up or down the list. 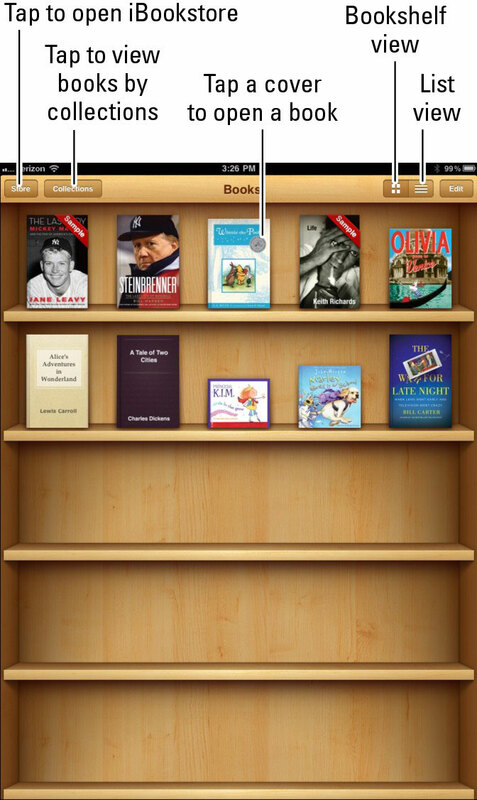 Remove a book from the bookshelf: In either view, tap Edit and then tap the book(s) you want to remove. Each book you tap displays a check mark; tap the book again to remove the check mark and thus deselect the book. When all the books you want to delete have check marks tap the red Delete button at top left. As with other content you purchase from Apple, you can restore (download) any book you’ve purchased from the Purchased tab of the iBookstore. Organize books by collections: If you have a vast library of e-books, you might want to organize titles by genre or subject by creating collections of like-minded works. You might have collections of mysteries, classics, biographies, children’s books, how-to’s, textbooks, and even all the For Dummies books you own. Tap New to add a new collection. Tap Edit and the red circle with the white dash to delete a collection. Tap Delete to finish the job. If the collection has books in it, you’re asked if you want to remove the contents of this collection from your iPad. If you choose not to remove them they’re returned to their original collections (Books, PDFs, or any other collection). If you want to change the name of a collection, tap its name. If you want to move a book or PDF to a collection, go to the bookshelf, tap each work you want to move, and then tap Move. Select the new collection for these titles. A book can reside only in one collection at a time.